Free Local Towing W/Major Repairs "Phones Answered 24/7"
We're a QUALITY transmission and general auto repair service company. We are a facility that you and your family can trust going to for all your auto and truck repair needs. Since opening for business in 1983, we have strived to provide quality products and services which are second to none. Call or come by. No appointment required. "Hello and welcome to Eagle Transmission Richardson's web site. On behalf of all of us at Eagle Transmission, we recognize that creating customer value is the ultimate measure of one's work performance. Our entire staff, including managers, production, technical staff, service writers and pick-and-delivery personnel are committed to achieving this goal. You can trust our quality work and good name. With 23 years of quality service, we can assure you that we offer the very highest of customer satisfaction. Eagle -- the one to trust." They worked on my liincoln navigator and now it works good. Thanks Eagle. 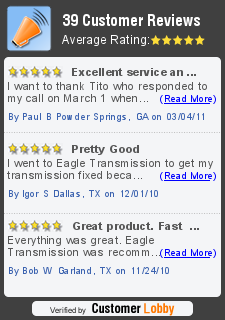 Why Choose Eagle Transmission Richardson? Welcome to Eagle Transmission Shop Richardson TX. We are one of the most respected transmission shops in Dallas, service transmission in RichardsonTX and surrounding areas. Companies in the Richardson and surrounding areas and have been serving the local area with superior service for over two decades Serving (Richardson, Dallas, Plano, Garland, Allen, Wylie, Sacshe). We offer transmission repairs, auto repairs and fleet services, as well as other special services for foreign and domestic vehicles and pick up truck. Transmission Repair Starting at $485 and Up. Visit us to discover what sets us apart from the competition and why we have grown to be a leader in transmission repair in Dallas and surrounding areas. Our highly trained and experienced transmission specialists provide free diagnostics to determine the problem and use state of the art equipment to diagnose and repair your vehicle. We also provide free towing with repairs. Check engine light on? Not sure if you have a problem or need a second opinion? Stop by or call and we can arrange to have a free diagnostic given. If you are having a problem, stop in as well. 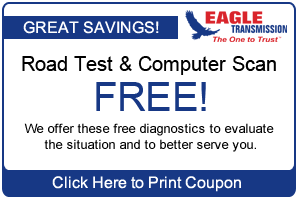 Eagle Transmissions offers online promotions for transmission repair, transmission fluid change and a free air conditioning check up to keep you vehicle in optimal condition. You can view and print the coupons from our website to save money on vehicle repairs and service. Call us today for transmission repairs, auto repairs or other services. We work to provide our customers with the highest level of service. In addition, we provide multiple payment plans and no credit check financing to help our customers finance the repairs they require and get them back on the road. Serving Richardson, North Dallas, Dallas, Garland, Allen, Sachse, Wylie, Plano and Murphy, Eagle Transmission has become known as one of the leading transmission service businesses in the entire surrounding region. We have been servicing transmissions for well over two decades, and offer a number of transmission repair and other automotive repair services. Whether you have a domestic or foreign vehicle including pickup trucks, our transmissions repair facility can handle any type of work. Stop by and discover why we stand apart from competitors and are considered a leading transmission repairs service provider throughout Plano and Dallas. Our experienced and highly trained technicians will perform free diagnostics in order to determine your transmission problem using the latest state-of-the-art tools. Additionally, count on us to provide free towing when you have repair work done. As a full-service automotive center, we can check engine light problems as well. transmission fluid change to keep your vehicle in optimal condition. You can view and print the coupons from our website to save money on vehicle repairs and service. If you are searching for any type of automotive work or transmissions service, give us a call or stop by today. We work hard to provide our clients with a high level of quality repair work. Whether it's a repair transmission job, or any other automotive repair requirement, we have a number of convenient payment plan options including no credit check financing, allowing our customers to get back on the road as quickly as possible. 2013 Dodge Dart Sedan Using Automatic Transmission from Hyundai? When should I have my Automatic Transmission serviced? Gears Galore: How Many Speeds Is Too Many? Best mileage: Automatic or manual?